This Christmas, have fun your own way. Get creative, feel festive and feel at home. Foliage – welcome your visitors with a natural door wreath and place galands around your banister, or drape them across a hall table. Decorate them with fairy lights and a couple of statement baubles for added wow factor. Scent your home – scented candles will fill your home with a festive fragrance. We love a candle with notes of cinnamon and cloves, to really get us into the Christmas spirit. The Winter Candle from The White Company is a fave. 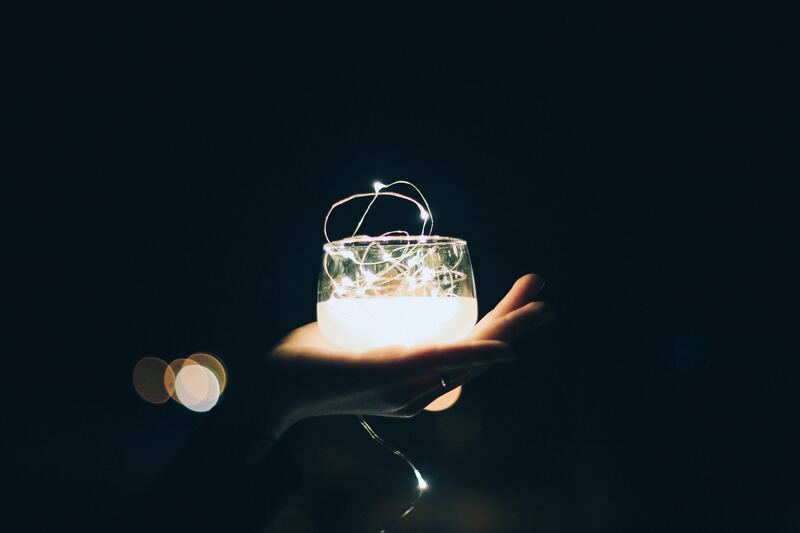 Light – candles and well placed fairy lights will add a warm and welcoming glow to your home. Candles placed in chimney lanterns on consoles, mantlepieces or window ledges will add instant warmth to your home and create a cosy atmosphere on cold, wintry nights. Add some sparkle – we love a bit of sparkle! Statement baubles placed in a tall vase on a hall console look great – when placed next to a candle on a mirror, it will create the perfect atmosphere to welcome guests. Now all you have to do is pop open the Champagne! Whether you prefer a real or plastic tree, they’re so much fun to chose together as a family. It’s all part of making those childhood memories that they’ll cherish forever. Decorations stack up beautifully on either style of tree too! Of course, there aren’t any rules to decorating the tree. There’s a lot of fun to be had being silly with the kids, throwing on beads and tinsel, piling on the baubles and topping it all off with a big star, or a crazy-haired angel. To keep things stylish and personal, dress the tree with a few choice baubles and some lights – nothing more. We’ve heard of one family who buys a single new bauble every year – each one different and special in some way – and has amassed a collection of unique, meaningful tree decorations over time. It’s a sweet idea. Christmas is all about making those little memories together – and it helps to make the centrepiece of the festival meaningful and full of memories too. There’s an easy and really good looking way to make your real Christmas tree less prickly. And it makes presents under the tree look even better. Throw a flat bed sheet or a blanket down under the tree pot, and bunch it up a little bit into a pleasing, landscape-like shape that covers the danger zone of needle droppage. Once in a while, grab the corners of the sheet to gather the needles in the middle, and hoover them up in one satisfying go. 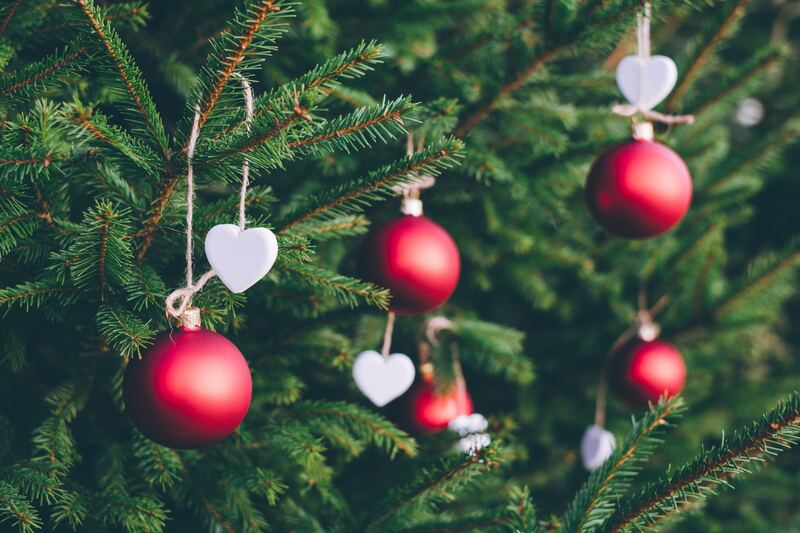 It depends what your house or flat layout is like, but in most homes the living room is the defacto place for Christmas trees – and where there’s a bay window, you’re likely to find a tree. Open those curtains (or blinds) to show it off, and close them to bask in its twinkling lights. Corners work well in smaller rooms – just pull the tree out to decorate it all the way around, then carefully slip it into place when you’ve got it looking just right. Furniture can move around to make space for it. The tree’s always the star of the show at Christmas. Why not think about your Christmas tree on a smaller scale? A potted plant, dressed up with a few little decorations and a nice clay pot is a beautiful festive addition. There are some beautiful twig trees available that add a sprinkle of winter magic to any room. Keep it simple and have fun – that’s what Christmas is about, after all. Want Better Looking Bay Windows this Christmas? At The Home of Interiors, we just love big, beautiful bay windows for all the light they let in – and all the space they leave for Christmas decorating. Complete your living room look with our gorgeous range of curtain poles for bay windows, and give your Christmas tree a stage to shine on. 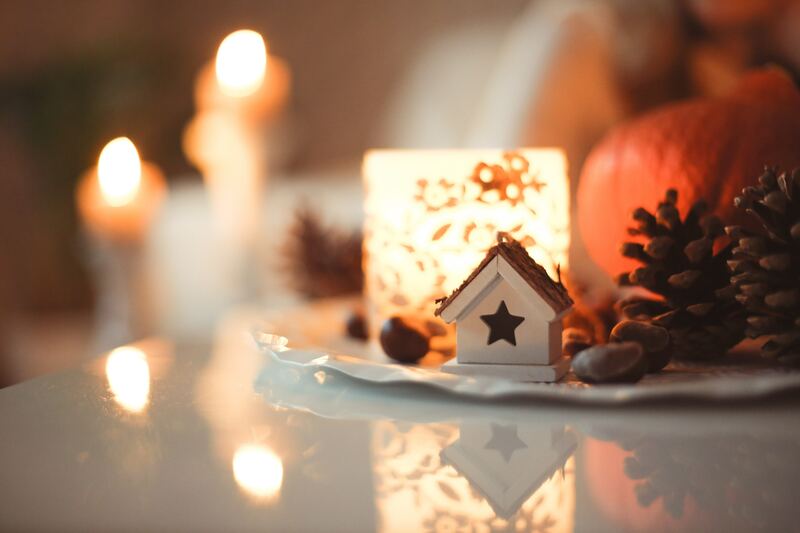 A clutter free, organised home creates a calming atmosphere at Christmas. There aren’t too many essentials for Christmas decorations. There’s the tree, stockings for little presents and maybe most importantly – lights. Fairy lights are the magical, secret ingredient. Without making a room too busy, they set the mood, triggering all those great memories of Christmas past. If you’ve draped some lights around your tree, a few subtle (maybe even coloured) lights dotted around the house, in the kitchen or dining room, can add a world of festive ambience at little expense – with next to no room taken up. Battery-powered lights in jars are cute, clean and easy to store in the New Year (but they’re great when you need a little less light, so you might be tempted to just leave them out!). Once stockings are hung up, there’s not too much else to do. A few small, stylish but fun details can add a touch of magic for guests and family, without going overboard. Christmas is a great time to get creative. Get the kids involved with some (supervised!) 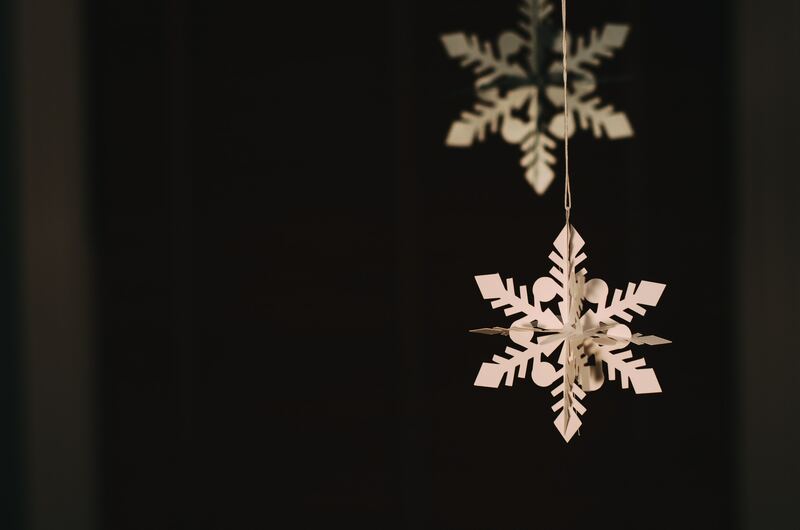 snowflake cutting – and make your hallway ceiling a blizzard of festivity. We love this idea, the brainchild of iheart organizing – where you’ll find more tips on making snowflakes en masse. Or if you’ve got some spare mason jars, you could make some personalised snow globes. They’re really easy and quick to make, and won’t break the bank either. All you need is a tight sealing jar, some glue, glitter, cooking glycerin and a few fun trinkets to make a snowstorm with. You’ve got the inner area of the lid to build your scene on. Lego and small toys, or pebbles and pine cones – stuff you might have laying around or can find easily – can be glued on to the inside of the lid, painted and personalised to your liking. When your glued and painted pieces are all dry, fill the jar partially with water. Start with a couple of pinches of glitter (you can add more after) and a couple of teaspoons of glycerin. Stir it all up well. The glycerin will thicken up the water a little, to make the glitter fall slower – too much and it’ll stick. Add more glitter or glycerin if needed, stir, and fill the remainder of the jar (all the way to the rim) with water. Screw the lid back on quite tightly over a sink, mopping up the overspill. Turn it over and there you have it: your very own, totally unique snow globe – the perfect dinner table distraction for overfed bellies!